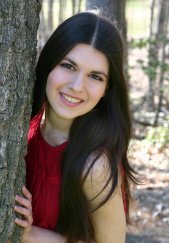 Last year I featured several young artists and crafters actively selling their homemade crafts, jewelry, fashions and accessories, art work, and photography on Etsy.com. Since Etsy is so much fun to browse, buy, and sell cool homemade items (as well as supplies, patterns, and vintage items), I decided I'd spotlight some of the talented young entrepreneurs I've met there recently. I'm really impressed by their level of creativity and skill, and I think you will be too. Aren't these the greatest? What an awesome gift to give a roommate, sister, cousin, best friend or yourself this holiday season! 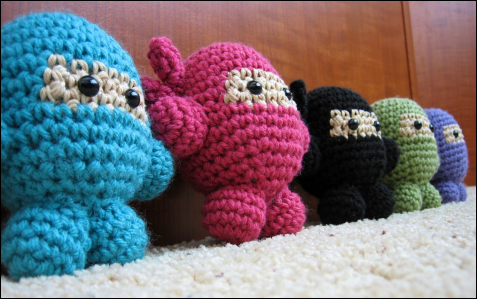 Daryn's little crocheted ninjas have mad skills and super powers. They measure in at about 4.5" tall, 4.25" wide, including arms, 9" around NOT including arms. Each one is made with acrylic yarn and polyester stuffing ... and lots of love, of course! No young woman should be without! How unique! Korean jade beads are laced between two strips of dark brown leather with durable waxed beading thread. The bracelet wraps around most wrists 3 times or it can be worn as a necklace. 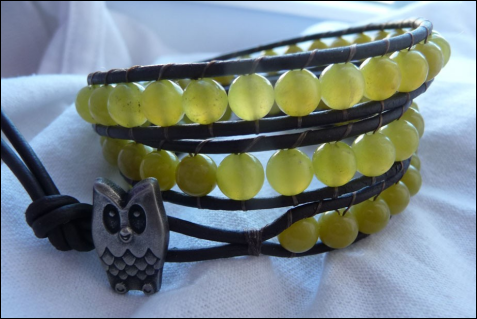 The wrap bracelet secures together with an awesome silver owl button. Need some wisdom in your life? Each bracelet arrives wrapped in tissue paper and tied with a ribbon - ready for gift giving or to treat yourself. What perfect chandelier earrings for a date, formal night out, or just because! 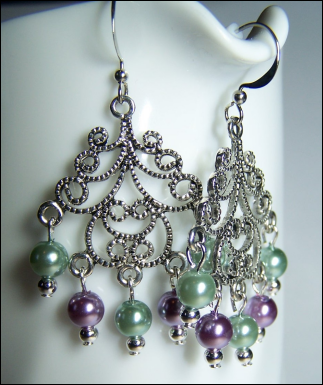 The swirls can be compared with beautiful waves crashing onto the ocean shore, and they're finished off with complimentary sea-green and dusty purple glass pearls and silver beads. Earring measures a bit over 1" across at its widest point. I'm sure you know at least one friend who'd absolutely love these earrings! 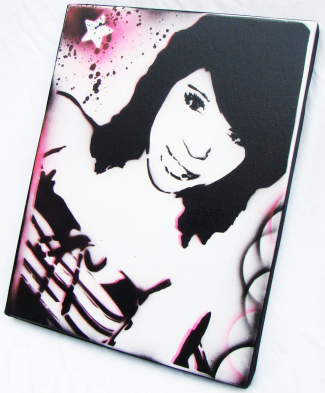 Custom portraits are an excellent gift idea for Christmas or any time of year! Take a photograph of you with your boyfriend, best friend, sister, mother, cousin ... whomever. Then Kellie will create a unique and eye-catching stretch canvas masterpiece just for you. Capture those favorite moments forever and put a long lasting smile on the face of someone you love! The Crochet Sisters, Lora and Mareenez, have done it again! Keep warm this winter with their most adorable 100% cotton hand-crocheted flowered stripe earflap beanie. 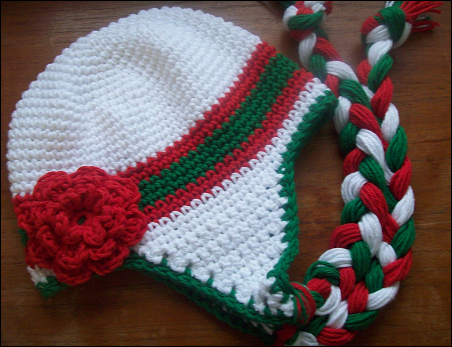 Beanie is white with red and emerald green stripes and a red flower. They make all kinds of awesome crochet accessories for children and young teens in their shop. The hat shown is size 5T-Preteen 20.5"-21.5". (To find your size, measure the circumference of your head at the thickest part.) So, if you ever need a sweet gift for a younger sibling or niece, this is the place to be! 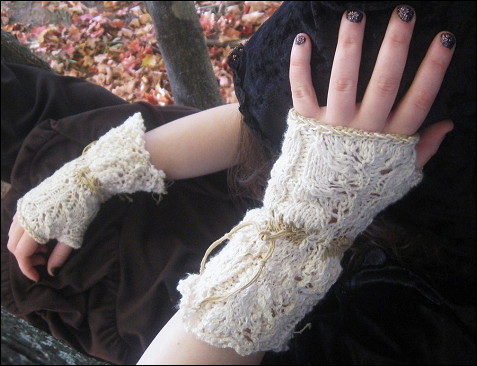 Another awesome sister-sister team, Rebekah and Grace bring us these snazzy Oriana lace mitts. Look at the beautiful knit detail! 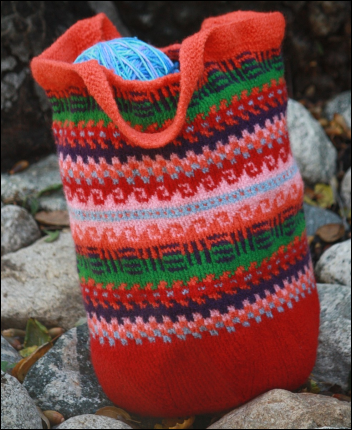 The Oriana mitts are made of a cotton-wool-acrylic mix for softness. Intricate cream lace is complete with golden sueded accents. Some of the details include: Latvian braid resembling wheat, leaf patterned lace on the palm and back of hand, and sueded eyelets on the wrist. These look great with denim! 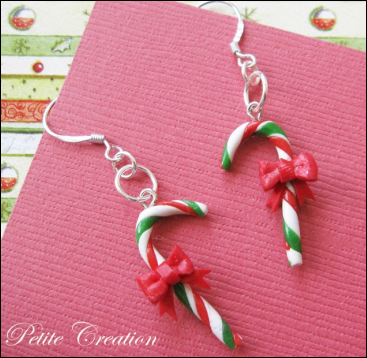 Nothing says Christmas quite like these adorably fun 2.1 cm tall peppermint candy cane earrings made of sterling silver and clay! Still thinking of what to wear for Christmas dinner? Traditional Christmas colour candy canes are wrapped with a cute red bow. What a great gift idea for you or a friend! I truly hope you enjoyed this selection of seasonal creations by the talented young women on Etsy. I plan to write more features like this for 2011, so if you enjoyed this one, definitely stay tuned!